Back at the start of the new year, as part of its ongoing coverage of the Atlantic Yards boondoggle of which the Ratner/Prokhorov (“Barclays”) basketball arena is an important constituent part, Atlantic Yards Report ran a pair of articles which conjoined to bleaken the rah-rahing regularly rallied up for the monied world of big-time organized sports. Yes, I’m a sports grump, and there is a lot to be grumpy about. When Mr. Oder reported about the critiques respecting how unfair it is not to compensate the young athletes who participate in big-money college sports, he missed reporting on a half-hour PBS Frontline segment “Money & March Madness” (video here and transcript here) that made even more scathingly clear the hypocrisy whereby the fairness of paying compensation to the athletes is being avoided. The theory for not paying the “student” basketball players is that because it is “college basketball” it constitutes “amateur” sports, and refusing to compensate the athletes keeps it that way. Everyone is catching onto the fact that big-money college basketball is hardly amateur or nonprofessional and the Frontline report adds to this the fact that very little of what goes on has to do with getting a college education, the ostensible rationale for declaring that the sport is amateur. • The “student” players are given scholarships to play [they may not cover all their costs- “on average $3,000 short” of essential expenses] but the rule (in effect since 1973) is that the scholarships cannot be multi-year, only one year at a time. If the player’s playing is unsatisfactory (or if the player is unable to play because of injury) the scholarship can be taken away so a player should not expect that the scholarships will be in place except to cover their successful playing, i.e. that the scholarships are not in place to provide for an education. If a player isn’t playing well it is likely the scholarship will be taken away, to be offered to a replacement player. I don’t know under what pretense the 1973 rule against multi-year scholarships was put into effect but it seems clear it works against the players’ interests. This is college? This is amateur? Isn’t this just a big-business rip-off run amok? Among other things, this sports/business mix, this not-for-profit/business mix doesn’t sound like a moral environment. Jane Jacobs, who wrote a series of books that seized the public’s attention and steered the public dialogue starting with "The Death and Life of Great American Cities" (1961), much later wrote another book that, as yet, has escaped the attention it probably deserves, “Systems of Survival: A Dialogue on the Moral Foundations of Commerce and Politics,” (1992). The book, which as its title indicates is about the morality of systems, convincingly argues the flaws of trying to mix things that should not be mixed, particularly mixing business enterprises with government and politics, because the moral systems that apply to each must necessarily remain different and incompatible (so much for the current fashionability of today’s “private-public partnerships” like Atlantic Yards). Perhaps inevitably, near the end of the book (p. 190) the dialogue gets around to the problem professional sports as a mix of business and something else (Jacobs’ book is structured like a Plato dialogue with competing ideas and questions expressed by multiple characters, fittingly so because by the end she ascribes much of the derivation of the book’s ideas to Plato himself). There is much in this ignored book by Jacobs to argue over (perhaps not successfully against) and to think about. It is hard to do her subtle thinking justice without going into much more detail. Jacobs would probably suggest that injustice is being produced when the mixing sports game with business allows a big-money college sports business decision to be made not to compensate the indentured servant athletes premised on a mythic sports game notion that these are amateur heroes who are truly college students. Jacobs’ book is full of other examples of what happens when realms that should remain distinct (together with their associated moralities) improperly intermix, so that one gets what she calls “monstrous hybrids.” Most typically the examples she gives involve an improper mixing of business and government (but there are also examples of improperly mixing charity and business). These include: Corrupt police forces where you pay for justice, similarly judges and judicial systems that sell out to commercial interests, Mafia integration into business, Marxist government intrusions into business, government “economic development projects” that quickly convert to “Pork-barrel projects for political purposes, the world over,” state creation of monopolies, when investment bankers resort to cunning cooperate raider-style warfare, accountants and lawyers who participate in the perpetration of fictions. Jacobs' point is not that either business or government is bad: She's sees both are good but only when in their separate places although one of the proper roles of government is to police the commercial sector. In “Systems of Survival,” Jacobs advances some intriguing anthropological notions about how sports began (like games, dance, music and art) as frolicking leisure play, in what was a purer sort of sport-for-the-sake-of-sport noncommercial context, like tournaments held among knights, and that such sports traditions (as in the case of the Olympics) were inherently linked to a tradition of amateurism (“Think about the long aristocratic tradition of the amateur with time on his hands exerting himself strenuously for sheer love of a sport, an art, or a field of learning– not for economic gain.”- p.79) But it would probably be too much to go into this at greater length in this article so as to chart all the implications it might have for the nuances of this discussion. When commercialism gets hold of sports all sorts of things can go awry, and sometimes when commercialism gets hold of sports it forays as well into the realm of politics and then things can get a whole lot worse. Were it not for sports we might never have had George W. Bush as president. The same PBS Frontline series that presented the “March Madness” program every four years presents a delving special, (always titled “The Choice”) about the respective presidential candidates (there should be one coming up soon enough about Romey and Obama). In 2004 when Bush was running against Kerry it presented interlaced biographies of those two men. One thing that was clear was that it was Bush’s involvement in the twisted use of sports, his lending of his face and personality for the promotion of the public funding of Texas Rangers stadium and the associated eminent domain land grab of land for the stadium and land around it (for real estate speculation purposes), that was a turning point for Bush and transformed him into a potential candidate for governor and ultimately for president. He proved his ability to sell what probably ought to have been considered odious: Look where it got him! Before his involvement with the Rangers stadium Bush was largely a failure, a draft avoider who went AWOL from the National Guard (where he had been politically ensconced to be safely away from Vietnam), a failed oil businessman, a heavy drinker, a poor student. The Frontline Narrator picks up: The plan was to build a new ballpark on seized land and then raise local sales taxes to pay for its construction. It generated some controversy. But Bush, good with people, came in and helped sell the deal. He became a partner and the club's most visible face. Followed by Frontline’s reporter: By far, his most successful experience as a businessman was with the Texas Rangers. He was businessman as politician, in effect. He was the public face and, in a way, front man for the Rangers franchise. He sat in a box at the Rangers games and shook hands. 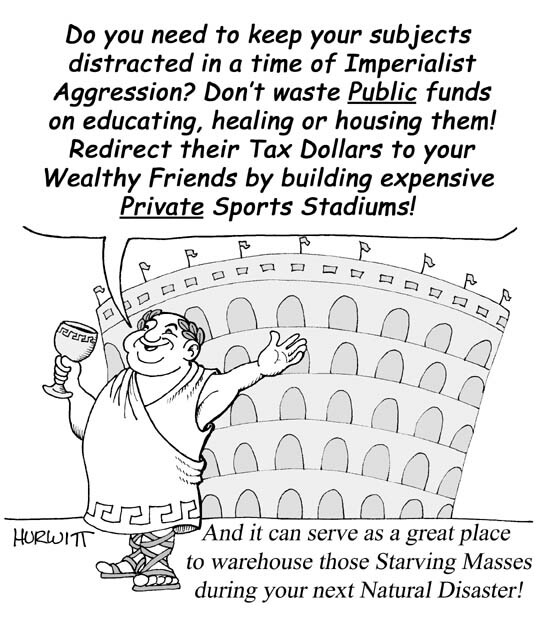 There was a big political component to that because they had to get the stadium built with public money. It didn't escape notice that he was the son of the president. And then he was surrounded with people like Roland Betts, who were very seasoned and experienced businessmen and who invested and piloted the project. And that was the one deal in his business career that he really did well on. Segueing back to the narrator: In just a few years, Bush reaped a personal profit of over $10 million,* while building his own big-league reputation. To reiterate: It was Bush’s ability to put a smiley face on this enormous transfer of wealth from the general tax populace to a wealthy elite that proved his qualifications for further ascendency. Nicholas Kristoff suggests that part of Bush’s job, along with conspiring “with city officials to seize private property that would be handed over to the Bush group” for real estate speculation purposes was to mislead “the city into raising taxes to build a $200 million stadium” being handed over to the Rangers. Sports fandom can be used to manipulate, sometimes for arguable good as the point was made in the film Invictus about Nelson Mandela’s use of the 1995 Rugby World Cup in dismantling the after-effects of apartheid, and sometimes as in the case of Bush and the Rangers stadium or Ratner’s arena, to gloss over real estate land grabs and major raids on the public treasury. Manipulated by their fandom the public often fails to appreciate the significant costs into which they have been suckered. It definitely wasn’t the entire story or the only cause, but the $11 billion* 2004 Olympics in Athens definitely helped lead into the current Greek fiscal crisis. Many of the Greek facilities built for that Olympics are now mothballed and becoming modern ruins. Did the feeling that all possible and affordable, in retrospect not so realistic, contribute to the other famously fuzzy accounting that accompanied Greece’s addition to the eurozone in January 1, 2001? And many believe that the Greek fiscal crisis could precipitate the dissolution of the eurozone itself as a run on Greece’s banks turns into a run on Spain’s and ultimately those of Italy, one of the larger economies in the zone. Cities that host the Olympics don’t come ahead financially although there are inevitably those that will take both sides arguing whether there is sometimes benefit. But the costs frequently fall unevenly on the less advantaged. China was accused of displacing more than 2 million people from their homes in preparation for the Olympics held there with inadequate compensation or due process. Brasil, preparing for the 2016 Olympic games, is looking to evict the poor from the decades-old settlement in which they live. (See the New York Times Story: Slum Dwellers Are Defying Brazil’s Grand Design for Olympics, By Simon Romero, March 4, 2012.) In theory the planned Olympic Village in Rio De Janeiro will be “a new piece of the city,” it’s just that this promotional description disregards that this redevelopment jettisons an old already existing piece of the city, and as pointed out, the hosting of the Olympics will only last “a few weeks.” The poor who are being displaced from the neighborhood are in very technical terms “squatters,” but given that property laws are enforced in Brasil (like in some other parts of South and Central America) with the kind of clarity and feverish vigilance with which we in the United States enforce our immigration laws (i.e. practically none), that doesn’t mean that these lower income folk should be thought of as undeserving of protections and rights; being a squatter in Brasil is not like being a squatter in the United States. The residents of the settlement are resisting their pending eviction and the Times story describes a Brazilian press sympathetic to their plight. The Times story points that the resistance of those being evicted coupled with efforts from local construction unions to benefit more substantially from the building of the facilities means that the construction is behind schedule and facing nightmarish overruns. At the same time the Brazilian press is pursuing corruption allegations about Olympic and World Cup plans and “scandals involving high-ranking sports officials.” Further perspective on the eviction of the lower class residents from their “favela” neighborhood is available in this opinion piece in the Times by Theresa Williamson, a city planner, who heads Catalytic Communities, a Rio de Janeiro-based organization assisting the favela communities: A Missed Opportunity in Rio, April 3, 2012. Having proclaimed that I am not a sports spectator I must admit that I have been known to occasionally sit for a prolonged spell watching the Olympics (and it is a way to spend time with my wife who will inevitably watch some of the Olympics). Things like synchronized swimming, ice skating and gymnastics can be beautiful and some things like ski jumping and snow boarding in a half-pipe demonstrate human abilities that, like magic tricks are fascinating to watch* . . But how much would I call upon others, especially the already disadvantaged, to sacrifice for their glorification? Romney In the Footsteps of Bush? On the subject of whether Romney “overstated his contributions” to the Utah Olympics and was motivated by his political ambitions to take the position to “give him a platform from which to jump,” see this Washington Post story which seems to pull some of its punches with its he-said/she-said style: 10 years after Salt Lake City Olympics, questions about Romney’s contributions, By Amy Shipley, February 12. Many New Yorkers are happy that Mayor Michael Bloomberg did not succeed in luring the 2012 summer Olympics to New York City (even reportedly a historically revisionist Mayor Michael Bloomberg himself!). That is certainly the Noticing New York point of view. In the “what ifs, and might-have-been department,” it is interesting to wonder though: Would the “ethical swamp” of the Olympics have found itself outmatched and unable to navigate the daunting morals of New York State mega-project real estate, or would it have been vice versa? You don’t have to like the sport of boxing to have a pronounced appreciation for Mohamed Ali as a human being. It is so sad to see that articulate beautiful man reduced by Parkinson’s disease, ultimately unable to speak in public, likely caused by the pugilistic trauma of repeated blows to the head, a condition that affects a high percentage of boxers. British football also involves the prospect of similar head injury. It isn’t just professional football where brain injuries are being suffered. PBS’s Frontline series, mentioned at the beginning of this article for its coverage of the abusive treatment of college basketball players in connection with “March Madness” and big business college sports, has also covered how High School and College Football players are suffering similar CTE (Chronic traumatic encephalopathy) damage, visible under the microscope when the brains of very young athletes are autopsied. (See: Football High, April 12, 2011) This Frontline documentary is not exclusively about the young players suffering progressive CTE, it is about how adults are pressuring young High School athletes to take all sorts of risks also, for instance, resulting in unnecessary heat stroke deaths and hospitalizations for coma, renal failure and potential permanent organ failure or less severe injuries that may debilitate and cause those athletes life-long pain. The Frontline program examines the high-stakes influence of money on the High School sports activities and the way that these feed into the big-money college system with the High School players under scrutiny by “an army of college scouts and national media.” The immiscible line having been crossed, these kids no longer seem to be playing for their own fun and fellowship; there no longer seems to be sporting balance to it all. OK, virtually all sports have some risk: You can be hit by a car biking through the streets of New York, horseback riding involves riding a several thousand pound animals that are unpredictable, you can drown swimming, you can wear out your knees running, but the risks seem qualitatively different when injury becomes almost more likely than not. In considering these Frontline stories about the way that adults are treating and influencing students, I think we tend to recoil in light of the “consensus among neuroscientists, for example, that brain regions and systems responsible for foresight, self-regulation, risk assessment and responsiveness to social influences continue to mature into young adulthood.” (See: The Young and the Reckless, by Elisabeth S. Scott and Laurence Steinberg, November 13, 2009.) Even without putting adolescence into the mix, sports fandom seems to be frequently accompanied by a lack of critical thinking, an abandonment of judgement. That doesn’t mean that sports fans should be denied their own choices, but when such a lack of critical thinking and judgment is abused as an opportunity to hurt others who are not in a position to look out for themselves it becomes highly objectionable. 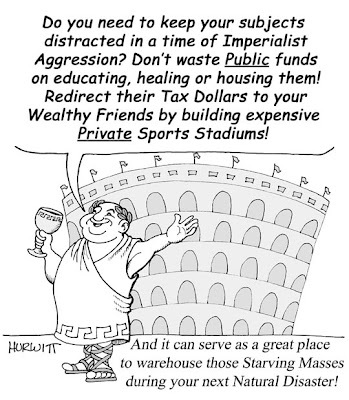 Children and student athletes shouldn’t be taken advantage of, just the same way as I object, when the lack of critical thinking associated with sports fandom is abused to divert my taxes into the pockets of the wealthiest or to spearhead their unfair land grabs at the expense of the poor and others through eminent domain abuse. When sports fandom collides with critical thinking about abuses it would seem that it ought to be a teachable moment where we as adults can educate the younger generation that there are limits that should not be surpassed in the name of uncritical fandom: Why then is it that we so often feel that it must instead be the reverse and that adult judgment, knowledge and experience must succumb to the childish urge to cater to fandom at all costs? I went to the recent June 10, 2012 clergy-led rally protesting the opening of the Prokhorov/Ratner (Barclays) basketball arena much of which involved pointing out that the arena was arriving on the scene with broken promises* about virtually everything else that was supposed to accompany it; jobs, housing, respect for the community. Many speakers made the point that public funds could have been spent on things of more value to the community than an arena. With all this, it was interesting how often the ministers and other speakers felt they had to craft into their expressions of ire hurled at the developer, admonitions to the younger generation of the community not to be distracted by the hype about the arrival of the Nets basketball team or the associated Jay-Z hoopla. It was further suggested that aware young people from the neighborhood should circumspectly avoid (boycott) the arena, although it was also pointed out that many young people in the neighborhood (for whom so many promises had been broken) might find it difficult to afford the high cost of a ticket to the arena, that the tickets were priced with a very different audience strata in mind. The fact that I am a sports grump is not going to change the fact that sports fans abound. At least one of my daughters has expressed doubt that she is likely to discover a boyfriend who is not a sports fan. That’s not what I ask for; fans can be fans, but I would ask for a responsible consciousness to accompany that fandom. I would also ask the visitor to take note that the new Yankee Stadium, although it has fewer seats, takes up a larger footprint than the old so that it can incorporate inside the stadium non-taxpaying replacements (owned by the Yankee team owners) for the formerly tax-paying independent sports businesses that surrounded Yankee stadium and are now (the stadium moved a distance away from them) consequently struggling. If fans in their fandom can manage to stay conscious of prices paid such as this then perhaps sports fandom won’t continue to be the subject of abuse that makes the world a lot worse and leaves me grumpy.